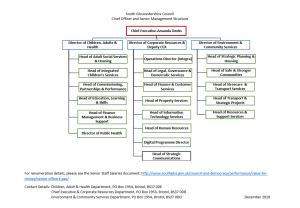 Information showing the pay grades for the chief executive, chief officer and other senior management posts and the senior management structure. The council is publishing this information to be open about spending and to improve access to data. This has previously been available to the public but the council is now posting the information in accordance with the latest guidance from the open government licence and data.gov.uk code of conduct. On this occasion it has been necessary to exclude names of individuals. The salary tables show the job title, service area, full-time equivalent (FTE) of minimum contracted hours and actual salary. For those senior staff not covered by the requirement to be identified by name or function they have been grouped by salary bands of £5,000 in Table 3. Table 4 shows the main areas of activity in the council’s three departments and identifies the number of employees working in those departments.